The original church dates from 1459. Along with its convent it was closed by Napoleon in the early 19th century, but re-established by the Franciscan Nuns of Christ in 1878. In 1950 work began on a new larger church, designed by the engineer G. Favaretto Fisca and the architect G. Lirussi. This building was consecrated in 1952 and at present houses the Institute of the Franciscan Nuns of Christ the King, founded by Princess Benedetta Savoia Carignano and Angela Canal, a noblewoman from Venice. A squarish nave and two aisles with a plain coffered ceiling and a shiny marble floor. There is a gallery connecting the church to the convent, and a small chapel to the right of the entrance. Rarely, but sometimes a nun accidentally leaves the door open. Famous as the church of the Ospedale della Pietà, the orphanage where Vivaldi taught and for whose talented girls he composed most of his concerti and oratorios. The complex had been enlarged in 1388, and modernised in 1493 and 1515. The current building dates from a rebuilding of the chapel of the Pietà between 1745-60 on a new site. It was finished well after Vivaldi's death, but it is said that the composer might have advised the architect Giorgio Massari on the positioning of the choirs and the use of a vestibule to provide a barrier to the noises of the Riva. Massari had won a competition in 1735 to provide plans for the reconstruction of the whole complex, but only the church was ever built. The façade was finally finished in 1906. Oval-shaped, like a concert hall, and designed for acoustics, particularly for choral performance. The ceiling painting is The Coronation of the Virgin, one of four works here by Tiepolo. Scaffolding update July 2018 It's been many years since we've seen the façade of the Pietà, and it's still covered. But at least the advert panel is for the place itself. Originally built in 1052 by the Boncigli family for the use of new immigrants. 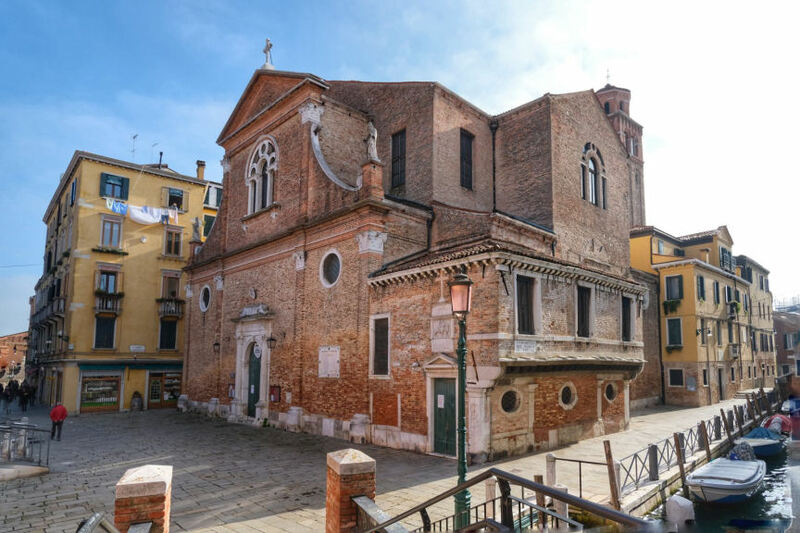 From 1470 the Council of Ten allowed the church to be used by Venice's large Greek Orthodox community, considered heretics at the time and so only allowed the use of this small and non-central church. In 1498 they were given permission to establish a Scuola here, in the name of Saint Nicholas. As early as 1511 Greek soldiers were petitioning the Council of Ten to grant them larger premises, as they were not happy sharing San Biagio which due to the 'mixture of peoples, tongues, voices and services ... creates a confusion worse than Babylon'. It was also too small for their growing congregation and had no space for burials, so that they were forced to 'mingle our bones with those of galleymen, porters and other low creatures' burying their dead 'upon the public way' where they were 'dug up up and thrown into the water within a few days of burial' to make way for others to be buried, this being the sole source of income for the poor church. They eventually moved to San Giorgio in 1543. 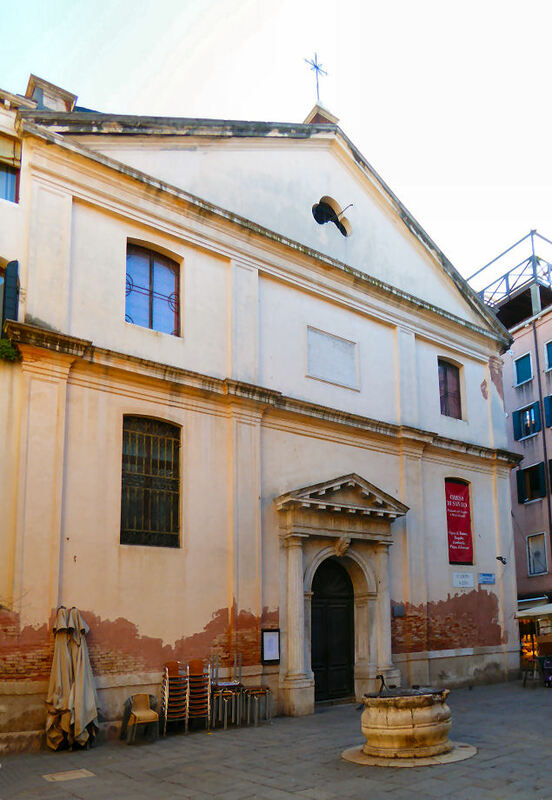 The present church dates from a rebuilding of 1749-54 by Francesco Bognolo, the architect of the Arsenale, brought about by the previous church falling into disrepair. Closed in 1810 by the French and reopened in 1817 as the parish church of the Navy. True to its more than somewhat functional external appearance it is now part of the naval museum next door, with a naval chaplain officiating at rare services. The ceiling panel, showing Saint Blaise in Glory is attributed to Giovanni Scagliaro (see right) a follower, maybe even a pupil, of Tiepolo. 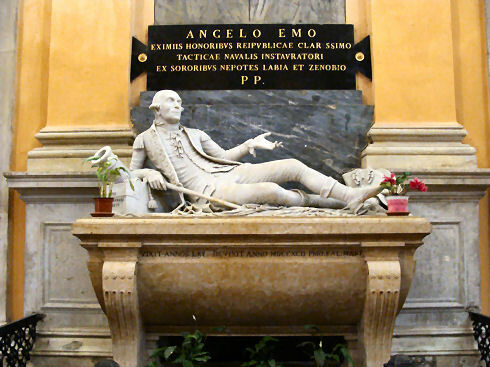 A monument to Admiral Angelo Emo, by Giovanni Ferrari, was taken from the demolished church of Santa Maria dei Servi and placed here in 1818. He was the last admiral of the Venetian Navy, who defeated the Bey of Tunis in 1784-86 and invented the floating battery, which can be seen with him on his monument (see photo below). 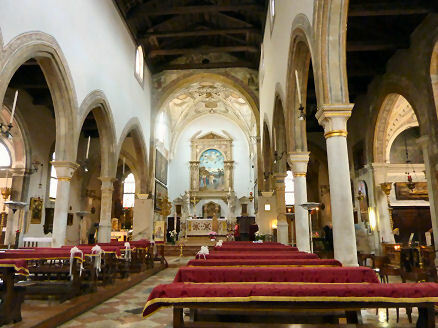 There are also five altars taken from the church of Sant'Anna. The local scuole, and their patron saints, are commemorated in the church and include not only the rope-makers and hemp-tanners that you'd expect, but also cap-makers, doughnut vendors and vendors of cheap food. In 840 a church was built on this site dedicated to Saint Demetrius of Thessalonica. It was renovated in 1070 and dedicated to Saint Bartholomew. In 1291 Bartolomeo Querini, the Bishop of Castello had a hospice built here for the elderly and the infirm, also dedicated to Saint Bartholomew. This complex was taken over by the Friars Minor (the Minim Friars) in 1580. They converted the hospice to a monastery eight years later and rebuilt the church in its current form, with the continued patronage of the Querini family. It was consecrated on August 8th 1619. Between 1675 and 1688 the Bergamo portrait painter Giuseppe Ghislandi, known as Fra Galgario, was a lay brother here. This decision may have been to benefit his art, rather than his soul. He returned to Bergamo and entered another house of Friars Minor there, the convent of Galgario, hence his name. The monastery was suppressed by Napoleon in 1806, became a barracks and was demolished in 1885 to make way for the building of a school. The church was remodelled in the late 18th century, but the ceiling was preserved. An aisleless nave with a barco (nun's gallery) along the back wall with arms stretching half way down the sides. There are four shallow chapels each side with the first ones, at the back, being under the nun's gallery. All the good art here is at clerestory level or on the ceiling, the latter being by Giovanni Contarini (1603), a pupil of Titian. They were commissioned by Cesare Carafa at a cost of more than 80 gold ducats. One of the inevitable paintings by Palma Giovane here depicts four female saints, but has oddly had a hole cut into it top centre for an icon-like image of the Madonna and Child to be inserted - probably some earlier miracle-working image. Also San Francesco di Paula Heals a Possessed Man, one of the series of scene s from the life of the saint, is said to be by Giandomenico Tiepolo. The presbytery vault frescoes are by Michele Schiavone. You may notice that a clock has been painted on the right-hand side of the façade and wonder why. I asked an attendant and was told that it commemorates the fact that Saint Francis died at 9.30. 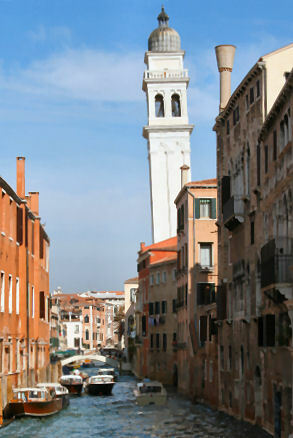 The church was mentioned in an article about Venice's declining population in the UK Guardian in March 2009. 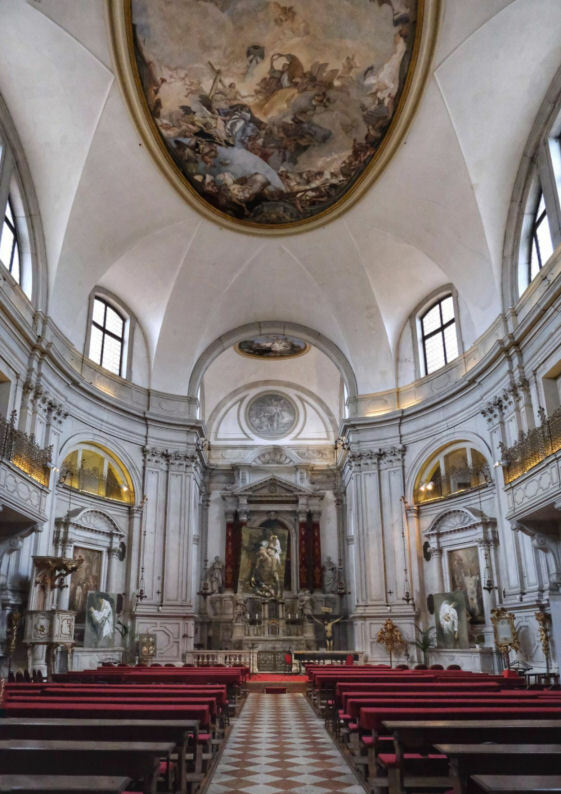 Today the cavernous interior of the church of San Francesco di Paola, complete with a Giandomenico Tiepolo painting, draws as few as eight worshippers to mass. "We did get 150 in for Ash Wednesday," said priest Don Giuseppe Faustini, "and we do fill up for funerals." The old church of San Bartolomeo is visible on de' Barbari's map of 1500 in the top left hand corner, beyond the spire of the demolished church of San Domenico. 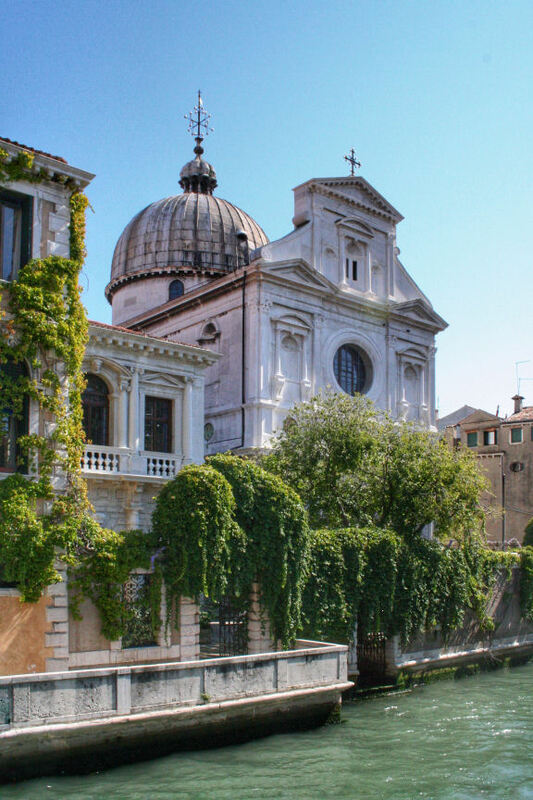 Built by and for the Greek community in Venice, primarily sailors and merchants, who had previously shared the nearby church of San Biagio and who numbered around 4000 at the time. 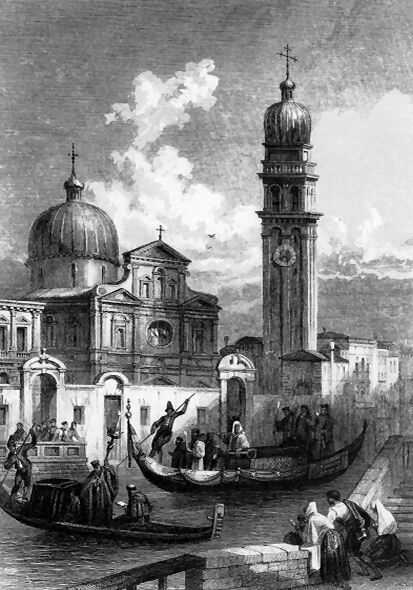 The church was financed by taxing all the Greek ships arriving in Venice. It was built in a Renaissance style reminiscent of Sansovino by Sante Lombardo from the laying of the foundation stone in 1539 until his death in 1547, and finished by Giannantonio Chiona. The church was consecrated in 1561 with the cupola by Chiona (and not Palladio, as has been claimed) added ten years later. The adjoining late-17th century buildings are by Baldassare Longhena. They are the Collegio Flangini and the smaller Scuola di San Nicolo, now a museum of Byzantine icons. The wall along the canal is also by Longhena. It encloses the rather lovely courtyard around the church, with olive trees and two fine well heads. 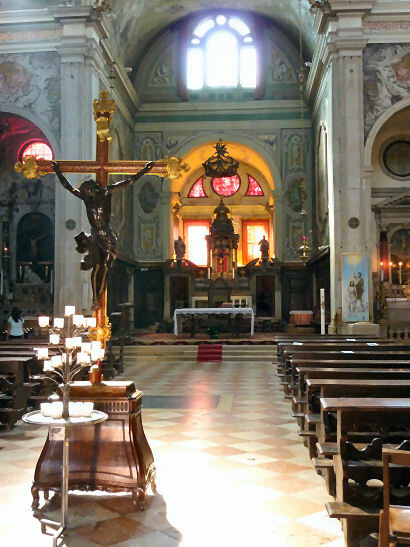 The church itself is free-standing, something of a rarity in Venice. Orthodox in atmosphere, aisleless with a frescoed central dome, painted by John the Cypriot, supervised by Tintoretto. There's also a women's gallery (about the construction of which Palladio is said to have been consulted) over the narthex at the back and there are dark wooden stalls all around the plain and grubby walls. But the thing which grabs the attention is the iconostasis, the icon screen - a glowing gold-overload all covered in 46 icons, many painted by the Cretan artist Michael Damaskenos in 1574 - Damaskenos having been in Venice between 1574 and 1582 - but made to be contemplated from a fair distance away, it has to be said. The monument to Gabriele Seviros is said to be the first known such work by Longhena. Built in 1582-92 by Simone Sorella, and leaning ever since. Its adjoining loggia (see below) is all that remains of the Renaissance cloister. The meaning of in Brágora is uncertain. It could refer to a square (agora), a fishing site (bragolare: to fish), or a marshy area (brago) combined with a stagnant canal (gora). Tradition has it that the first church on this site was one of the churches founded by Saint Magnus in the 7th century, but the earliest written record dates to 1090. This church is said to have been built to house relics of Saint John the Baptist. Rebuilt again in 1178 and 1475. The current Gothic church is this later 15th century rebuilding. Restoration with baroque embellishments was carried out in 1728. The façade is transitional: harking back to the gothic of, say, the Frari but verging on the renaissance style of Codussi, who was said to have been inspired by this church when designing San Michele and San Zaccaria. There’s a a ship's-keel roof and old columns. It’s a nicely lofty but compact space - a nave and two aisles with a pair of chapels in each. Unusual gilt decoration on the capitals of the pillars, with painting over the arches too. The last pair before the altar are square, carved and gilt pillars - they were once part of a decorative screen, the work of Sebastiano Mariani da Lugano, which was dismantled in the late 16th century, with some panels used to line the chancel, which is itself a bit of a surprising burst of rococo. The architect Massari, who designed the Gesuiati church, the Palzzo Grassi, and the Pietà where Vivaldi famously taught, is buried here. He was born in the campo that you enter if you leave by the side entrance of this church, called the Campiello del Piovan, at No 3752. He is also thought to have been responsible for the redecoration of the chapel housing the remains of San Giovanni Elemosinario here, in 1745. There are remains of 15th-century frescoes. Cima de Conigliano's impressive 1494 Baptism of Christ over the high altar was his first commission in Venice and the first known use of a narrative scene, rather than a formal arrangement of saints, over a high altar in Venice. It also features fine landscape and Cima's characteristic putto-heads in clouds. It was moved up the wall when ecclesiastical dictates saw the altar, which it had rested upon, moved forward in the late 16th century. Why the new-in-town Cima was chosen instead of the Vivarini, then dominant in Venice, is open to theories. Cima's later Constantine and Saint Helena of 1502 is in here too. There’s a Virgin with Saints John the Baptist and Andrew by Bartolomeo Vivarini, and a small painting of The Saviour Blessing by Alvise Vivarini, his nephew. Also a Deposition by Lazzaro Bastiani, which was taken from the church of Sant'Antonin. And there's even quite a likeable Palma il Giovanne The Washing of the Feet on the left-hand side of the chancel, which has a pleasing touch of the Tintorettos about it. He was born in a house in Calle del Dose nearby on 4th March 1678 and was baptised in this church two months later on the 6th of May. In fact this was his second baptism - he'd been hurriedly baptised at home as it was thought that he was too sickly to survive. So the font is made much of here (see right) as is a copy of his entry in the registry of births. 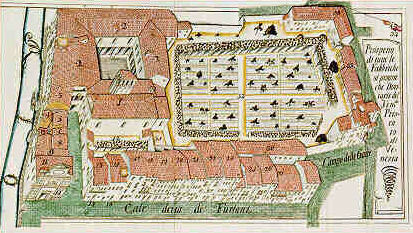 The original one can be seen on Matthaeus Merian's map of 1635 (see left) but was demolished (in 1826 or 1728) and replaced with the current belfry. The church of San Giovanni del Tempio and the adjacent hospital of Saint Catherine were built in 1187 by the Knights Templar of Saint John. 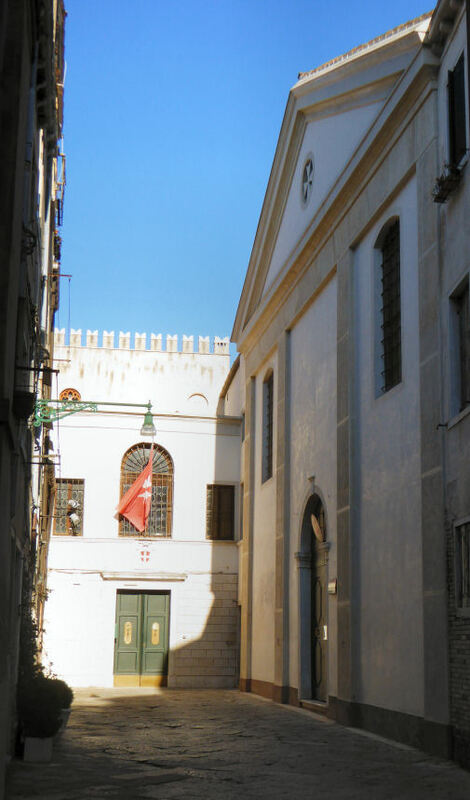 After the dissolution of the Knights Templar in 1312 the church passed to the Knights of Saint John of Rhodes, later called the Knights of Malta. The present church dates from a total rebuilding from 1498 to 1505, when the number of altars was reduced from seven to five, this work being instituted by Grand Master Sebastiano Michiel. Both church and monastery were suppressed and plundered by Napoleon in 1806. 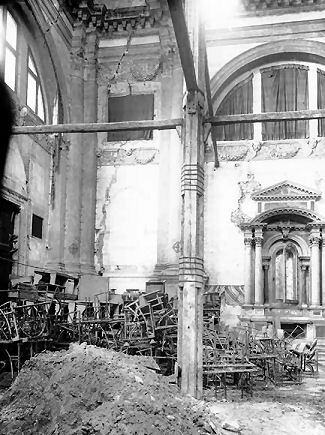 The altars were stripped and the church used as a theatre. The Commenda di Malta, part of this complex, was where works of art stripped from religious institutions at this time where stored pending a decision as to their fate. The church was repossessed and reopened by the Knights of Jerusalem in 1839 using altars and sculpture from other suppressed churches. An attached chapter house has some faded frescos which have recently been restored. A tall and boxy aisle-less nave with a square presbytery. On the inlaid marble high altar, which is early 16th century, by Cristoforo del Legname, and was taken from the demolished church of San Geminiano, there are three statues of saints by Bartolomeo Bergamasco. 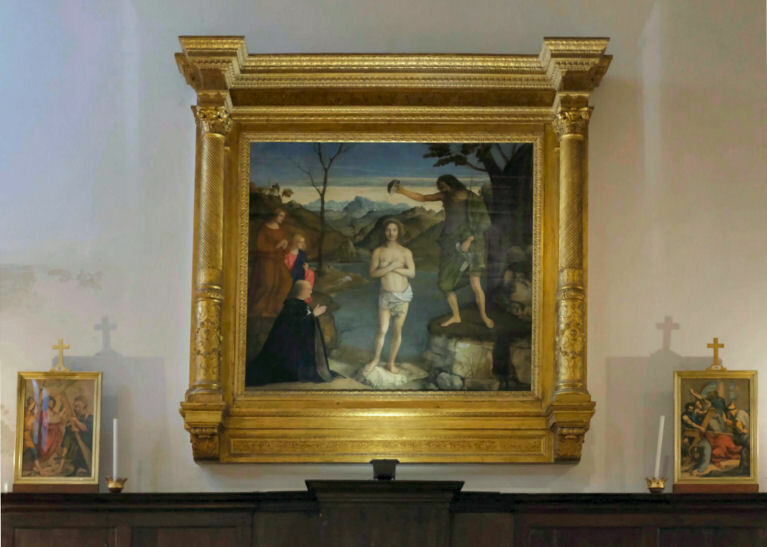 On the right-hand wall of the square apse is a Baptism of Christ of 1500 by the studio of Giovanni Bellini (see right). The donor figure on the left is Grand Master Sebastiano Michiel who was responsible for the rebuilding work at the same time as the commissioning of the painting. The large cloister contains many tombs of knights and is lined with their painted coats of arms. But the church was firmly closed at 11.45 on a Thursday. October 2016 Miki from Toronto writes, having been on a guided tour, saying that the guide had told them that 'a big renovation/reconstruction project is about to start'. Whether this is the work detailed below that's been delayed, or something new, I hope to find out. November 2015 Guided tours (1 hour duration, in Italian only) are bookable via segretaria@smomve.org Also, the Priorato is preparing apartments in the old hospital buildings of the order which will be ready next year. They are also restoring the garden (the biggest private garden in Venice evidently) back to its 15th century appearance, as represented in the old plan (see below) and it will be open to the public (small entrance fee) via the gate at Campo delle Gatte. And click here for photos of a visite exceptionnelle in 2009, by someone else, showing how the cloister looked before the recent restoration, how the Bellini used to be in the presbytery, and the frescoes in the chapter house. Scuola di San Giorgio degli Schiavoni bottom left. The name derives from the Mendicant Friars who founded the Hospice of Saint Lazarus here in 1601, one of the four Ospedali Maggiori. The order had run the San Lazzaro leper hospital on the island of the same name since 1262. The cloisters of the hospice and the body of the church were designed by Vincenzo Scamozzi and finished in 1631, after his death, with consecration following in 1636. The canal-facing temple-front façade, designed by Antonio Sardi and based upon an earlier design by Scamozzi was built by Sardi's son Giuseppe and not finished until 1673. There is a tiled hallway, used as a funerary chapel, between the outer doors and the actual church doors, with the cloisters stretching out through doorways to left and right. In this hallway are several monuments, including two by Sardi. The church itself is an aisle-less nave with grubby grey walls and stone-coloured and geometrical marble detailing. It was designed (1634-37) by Francesco Contin, for both services and music recitals, with a choir gallery along the right-hand wall. The whole back wall is taken up by the overpowering monument to Alvise Mocenigo, who defeated the Turks in Crete in the 1650s and died in battle in 1654. His statue is in the dark niche in the centre of the monument. The high altar is by Sardi, the altarpiece here is The Raising of Lazarus by Giovanni Fino, from 1857, and is not, for me, an artistic highlight of the church. The church has many tombs, including two designed by Longhena, and one for the Rezzonico family. 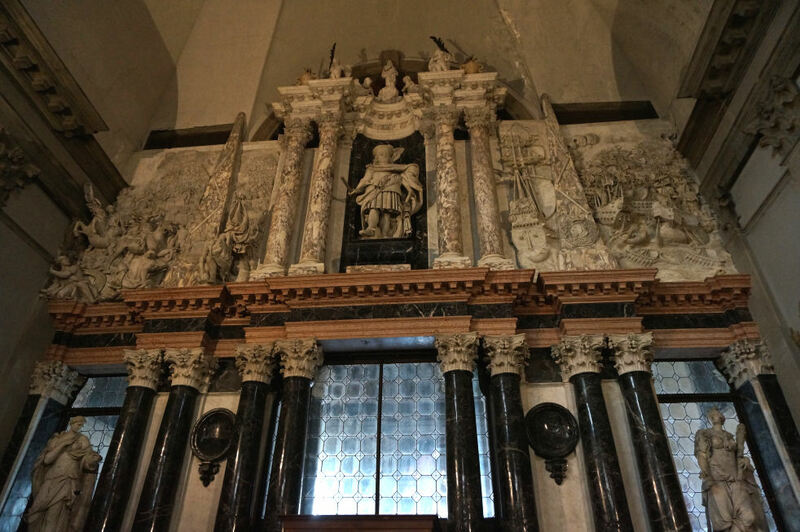 The rearmost pair of facing altars have altarpieces which were both taken from the Incurabili church. On the right is a somewhat dingy Crucifixion with the Virgin and Saint John 'almost certainly' by Veronese. It became better known, and its reputation improved, after its restoration for the 1939 Veronese exhibition in Venice. It was originally painted for the Incurabili. 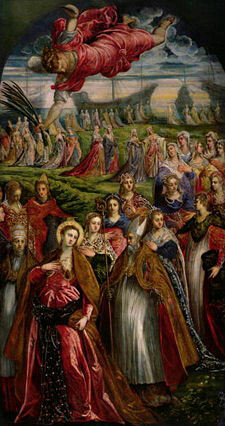 Opposite is the brighter and better Arrival of Saint Ursula and the Eleven Thousand Virgins at Cologne (see right) by Jacopo Tintoretto, also originally from the Incurabili. The pair on the altars nearest the apse are, on the left, Saint Helena by Guercino, opposite an Annunciation by Salviati, with an oddly cat-faced Madonna. This quartet makes this church worth the visit, I think. Vivaldi's father taught violin at the music school here from 1689-1693. Along with the Pieta it was one of the four institutions in Venice which took in abandoned girls who studied music and were trained to sing and play. The grills in the church behind which the orphan girls sang remain. Dating from the 1601-31 building too, it’s plain, even penal-looking, with a sundial on the south-facing side. It peeks in at the left-hand edge of Canaletto's Rio dei Mendicanti: Looking South. Also, from the other direction, the dark and smoky A view of the Rio dei Mendicanti by Guardi has the façade right of centre. Legend says a church here was built by the Badoer family in the 9th century and was dedicated to Santa Caterina Martire. It is said to have been rebuilt in 1054 and rededicated to the canonised Pope Leo IX, a supporter of the independence of Venice's churches. The first documented mention dates to 1108. Early in the 16th century the church was rebuilt by Pietro Lombardo and his son and reconsecrated in 1619, with the campanile demolished mid-century. Restored in 1783, with a plain façade retaining the Doric doorway from the early-16th century church. A surprisingly plush and interesting little church - an aisleless nave, created in the 18th century, with four unsimple side altars, The inner façade has tall credenzas used by local confraternities to house their vestments. The lovely Gussoni chapel to the right of the high altar is early work by Pietro Lombardo (and possibly his son Tullio, for the pieta panel). 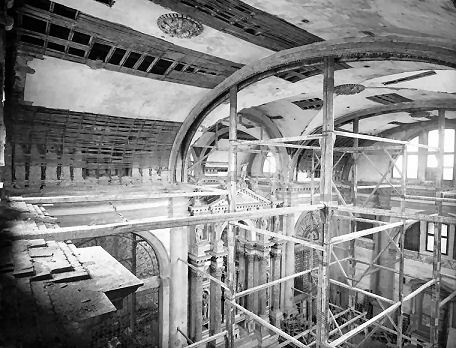 Restoration work in the mid-1980s revealed, beneath layers of plaster, fresco decoration between the cupola ribs - a rare remainder in the work of the Lombardo family. Canaletto is, tradition says, buried in this very chapel and was baptised in this church. He lived in a house facing onto the nearby Corte Perini. Works by Giandomenico Tiepolo, including the ceiling fresco of The Apotheosis of Saint Leo in Glory and the Exhaltation of the Cross (which now has a floor-standing mirror to aid viewing), an altarpiece by Palma Giovane and a late and restoration-damaged, but still impressive, Titian painting of Saint James. The Crucifixion is by Pietro della Vecchia, who was also known (erroneously) as Pietro Muttoni. His family name was also wrongly thought to be a nickname because he was famous for his emulation of the painting styles of his elders (and betters) which bordered on outright forgery. This painting is described as his best work but also as being more than a little disturbing, which I can't see, unless it's the weirdly calm bunch of burghers painted in at the bottom. Can be seen on the De Barbari map, probably dating from the 1054 building. Only the lower section still remains, in the campo to the left of the entrance. Probably truncated in 1783. 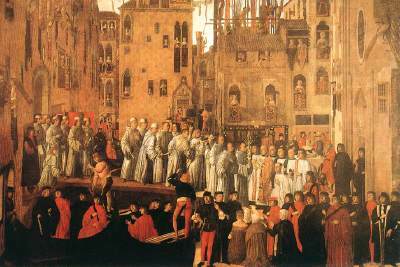 Miracle of the Relic of the Holy Cross in Campo San Lio (see above) c.1494, by Giovanni Mansueti is in the Accademia. It depicts an event in 1474 when a holy relic would not allow itself to be carried at the funeral of a doubting man, becoming too heavy to carry. 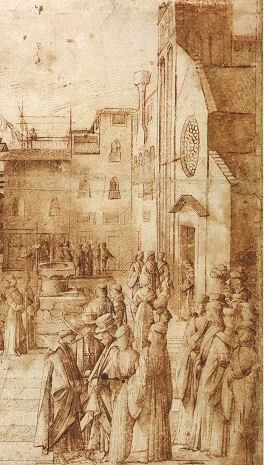 The church's façade (presumably the pre-Lombardo version) is to the right in the painting. There's also a drawing in the Uffizi, tentatively attributed to Gentile Bellini, who taught Mansueti, from around the same time, and which is thought to have been the basis of Mansueti's painting. It shows a bit more of the façade and campanile base (see detail right) and is the earliest surviving topographical drawing of Venice. The original church was founded in 812 by Orso Partecipazio (later Doge Partecipazio) with its Benedictine convent established by him in 854. Rebuilt several times, the current church dates from a complete rebuilding by Sorella in 1592-1602. But the façade was never even started. Marco Polo had been buried here (as had his father Niccolò) but his sarcophagus was lost during the rebuilding. Suppressed in 1810 with its art works dispersed. Some of the convent buildings in front of the church were demolished soon after. In 1842 the complex passed to Dominicans, but in 1865 was returned to the city council. 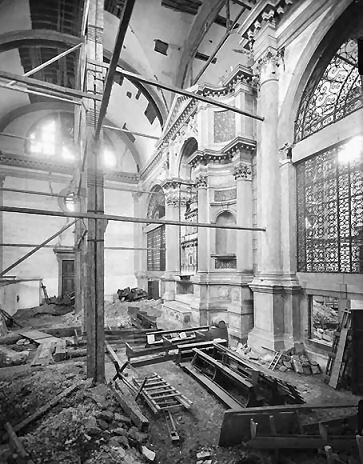 The church was badly damaged in World War 1, but restored in the 1950s (see the black and white photos, taken in March 1955 below). The convent buildings were later converted into a hospital, but are now sheltered housing. A huge single space divided in half widthways by a large three-bay screen with much decorative ironwork over the aisle arches. One half was for the laity and the other for the nuns - each side had its own organ. A panel depicting The Martyrdom of Saint Lawrence with Two Nuns by Jacobello del Fiore of c.1425, now in the Rijksmuseum, seems to have come from the convent here. 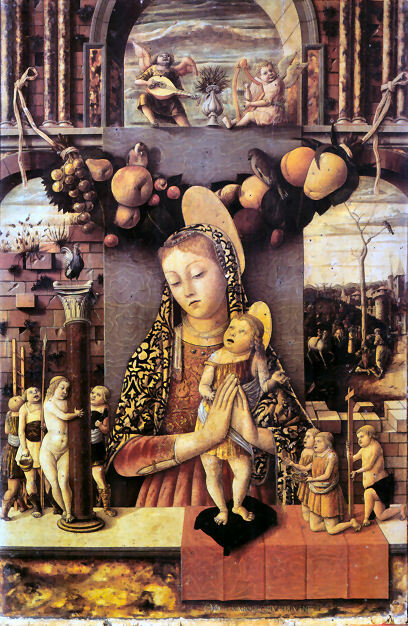 A typically strange and fruit-full Madonna and Child by Carlo Crivelli (see right) now in the Castelvecchio in Verona, was originally in the monastery here. The putti on the parapet are carrying the instruments of Christ's passion. A panel from a larger polyptych depicting Saint Stephen by Girolamo da Santacroce is now in the Brera. Another, very matching, panel depicting Saint Lawrence is in the Courtauld in London. Well into the 18th century the younger daughters of Venetian nobles were mostly (and famously) likely to end up in convents, the need for hefty dowries meaning that most families' funds could only stretch to the marriage of one daughter if the family were not to be, as they saw it, impoverished. The exploits of these unwilling nuns have been well reported, with San Zaccaria the most famous source of such stories. 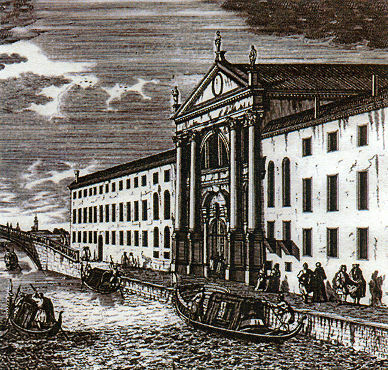 But here too, the second largest convent after San Zaccaria, a nun called Maria de Riva was found to be leaving the convent at night for liaisons with the French ambassador. When the Inquisitori di Stato ordered her to stay in the convent the ambassador objected and a not-inconsiderable diplomatic disputation ensued. 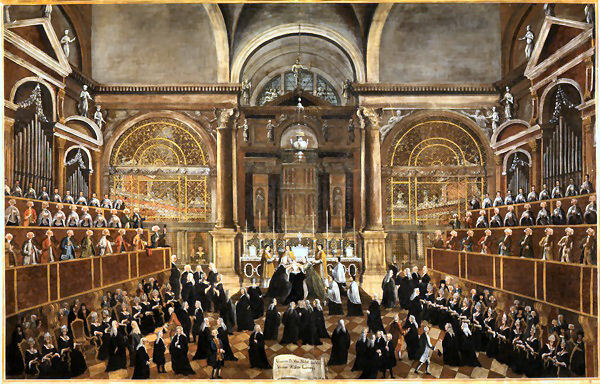 The Clothing Ceremony of a Nun at San Lorenzo, a 1789 painting by Gabriel Bella shows the interior of the church. It's in the Querini Stampalia. There is a drawing by Canaletto of c.1742/5 called Capriccio with San Lorenzo, Venice and Houses in Padua in the Morgan Library in New York. It's an imaginary view which nonetheless features the upper part of the façade and a bit of the upper exterior of the nave, with the campanile of San Moise! 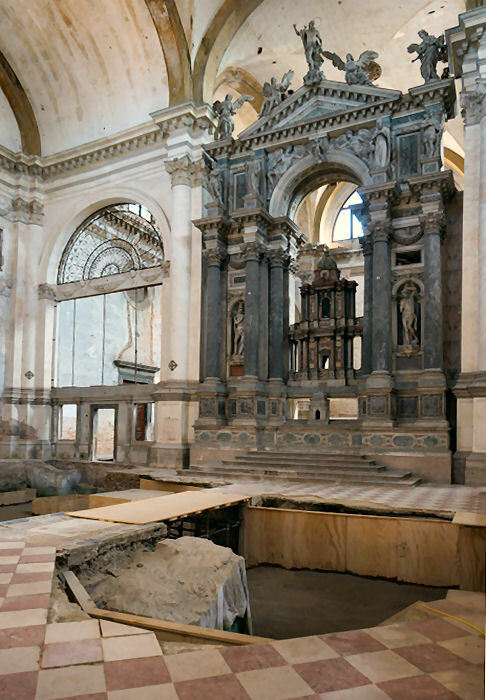 Never, usually, but in 2012 the church was acquired by Mexico for use as its Biennale location for nine years, with the condition that they restore the place. So in that year, for the first time in years, some small access was possible (see photo right). And then Mexico pulled out of the agreement. The campo was until quite recently also home to a Dingo cat sanctuary. Read more about this (with photos) on the Venice and Cats page on my other website. Named for Saint Martin of Tours, this church is traditionally said to have been founded in 650, but more reliable sources mention rebuilding in 932 and 1026. The current church dates from a rebuilding, funded by Antonio Contarini, to a design by Sansovino begun in 1540, and finished around 1619, with consecration following in 1653. The work progressed fitfully, it is thought, due to the poverty of the parish, it being near the Arsenale and populated mostly by poor labourers. It had to sell some vineyards to help pay for the church. This was erected in 1897 to a design by engineer Federico Berchet and architect Domenico Rupelo. 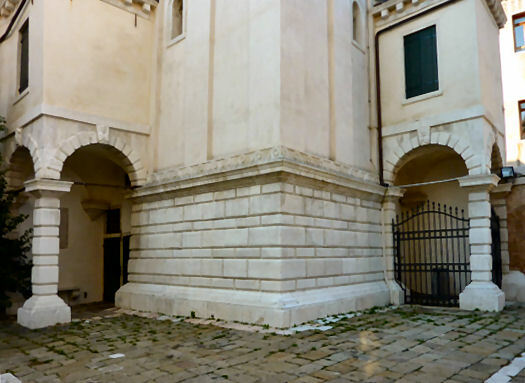 They retained Sansovino's doorway, to the right of which is a bocca di leone, a lion's mouth, for the posting of anonymous accusations of one's fellow citizens' sins. This church is Greek-cross shaped with eight chapels in pairs at the corners and it gives the impression of greater width than depth. The interior decoration is much later than the fabric of the church, being mostly 18th-century. 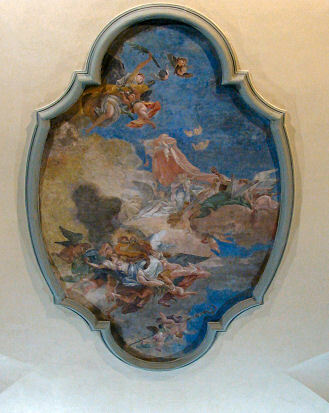 The flat ceiling is decorated with trompe l'oeil architectural perspectives by Domenico Bruni imitating the actual walls - in the middle is Saint Martin in Glory by Jacopo Guarana. Some attractive monochrome wall painting too. 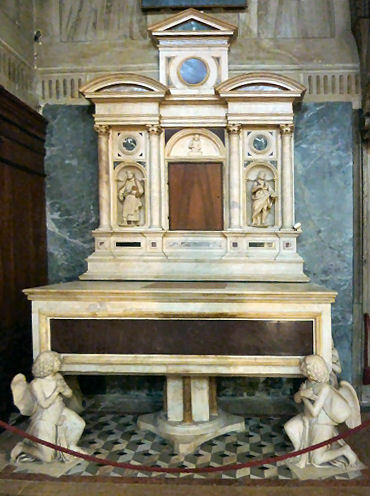 In a dark corner next to the pulpit is an altar table with legs in the form of angels by Tullio Lombardo (see below right) which came here from the suppressed and demolished church of San Sepolcro which stood on the Riva degli Schiavone. In the late 1960s the supporting angels were in a poor state, following the 1966 floods, and so were removed and restored by Venice in Peril. The largest chapel is frescoed by Fabio Canal. The tomb of Doge Francesco Erizzo over the side door was evidently conceived to echo the façade of his palazzo, which is visible over the canal through this door. The left-hand chapel near the front has signs pointing to a sacristy, which can best be described as a 'working' sacristy, but has an interesting fresco covering the ceiling with regular stripes of missing paint, looking just like it was painted between the beams which were later removed. 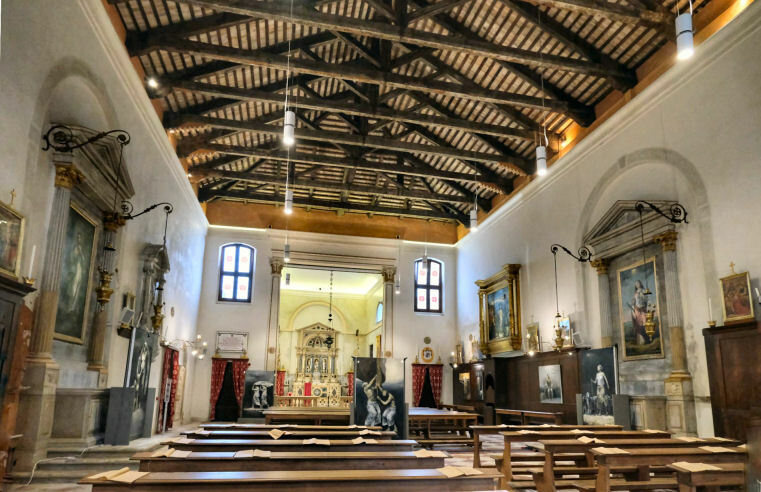 The area behind the altar screen is usually inaccessible, but correspondent Alexander from Toronto asked nicely and got to confirm the presence there of a Road to Calvary by Palma Giovane (see below). The small building attached to the right of the façade is the former Scuola di San Martino built around 1526-32 by the Guild of Ship Caulkers. It was partly rebuilt in 1584 and restored in 1772. 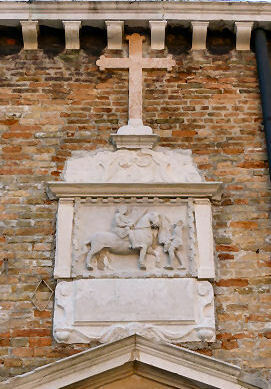 Over the door is a 15th century bas-relief (see right) of Saint Martin dividing his cloak with a poor man, an image which appears on biscuits given to children on the saint's feast day. Romanesque and dating from the Sansovino rebuilding (see photo above right). Restored in 1902 and 1973. San Pietro sits on the island of Olivolo which was the easternmost part of the city until the creation of Sant'Elena. A church of 650, one of the twelve said to have been established by Saint Magnus, was dedicated to Saints Sergius and Bacchus. The first documented reference to a cathedral to Saint Peter here is dated 853 but it's foundation is said to go back to 832-41. This first church was destroyed by fire in 1120 and rebuilt. 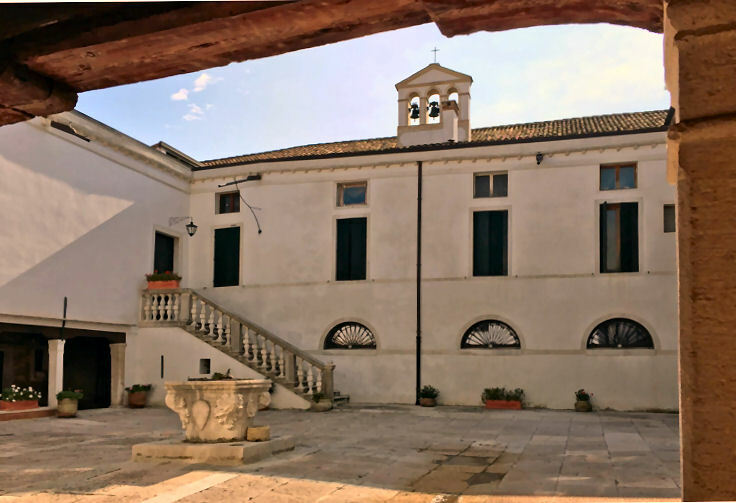 It was part of the bishop's residence until 1451 when the residence became the home of the Venetian patriarch, with Patriarch Tommaso Donà instigating restoration works soon after. This Romanesque church is shown on the de' Barbari map of 1500. Between 1508 and 1511 Patriarch Antonio Contarini carried out much work - roof and pavement repairs and the building of two chapels in the presbytery. 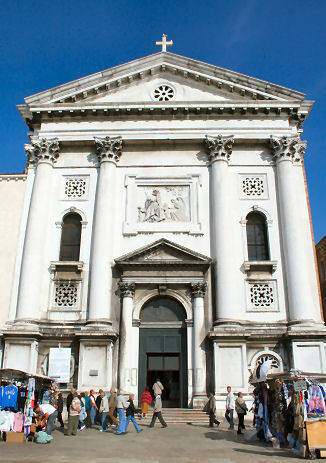 Patriarch Vincenzo Diedo commissioned Palladio in 1558 with the reconstruction of the church’s façade, the architect's first ecclesiastical commission in Venice. Diedo's death meant that Palladio's plans were not implemented (beyond a start made) until much later in the century, after Palladio's death, and they were then much altered by Francesco Smeraldi who had previously worked with him. 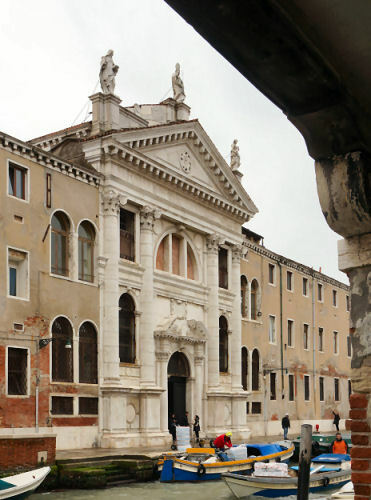 The façade (right) is one of Palladio's temples-within-temples, being a three-part façade echoing the interior, and it was his first piece of church design in Venice, where all of his churches were built. It was finished, along with substantial internal remodelling, under proto Giovanni Girolamo Grapiglia, another close follower of Palladio, in the 1620s. It was during this work that a crypt under the presbytery, which housed the remains of Saints Sergius and Bacchus, the church's original dedicatees, was demolished, and the saints' remains removed to a side altar. 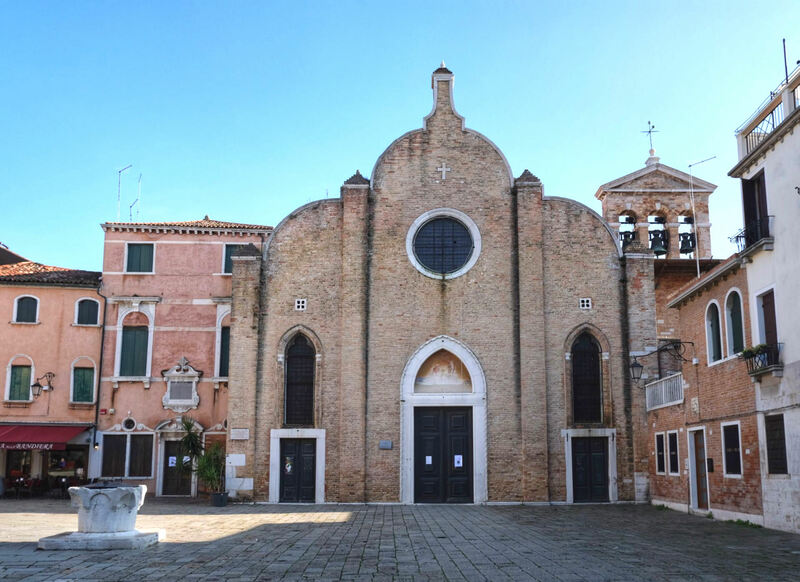 The church remained the see of the bishop of Venice, the cathedral of Venice, up to the fall of the Republic in 1807, when this function was transferred to San Marco. 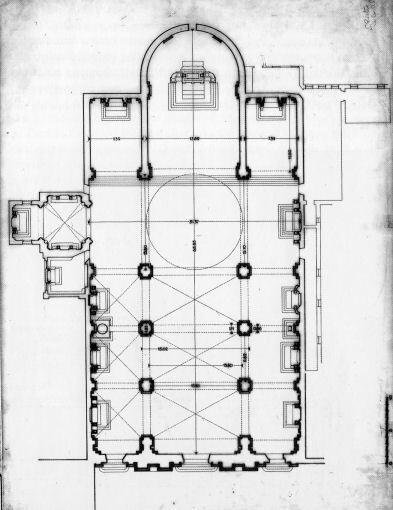 Latin-cross shaped, with a three-bay nave flanked by aisles each with three altars. This church has a big and light, and very calm and grey, interior worth the trip in itself. 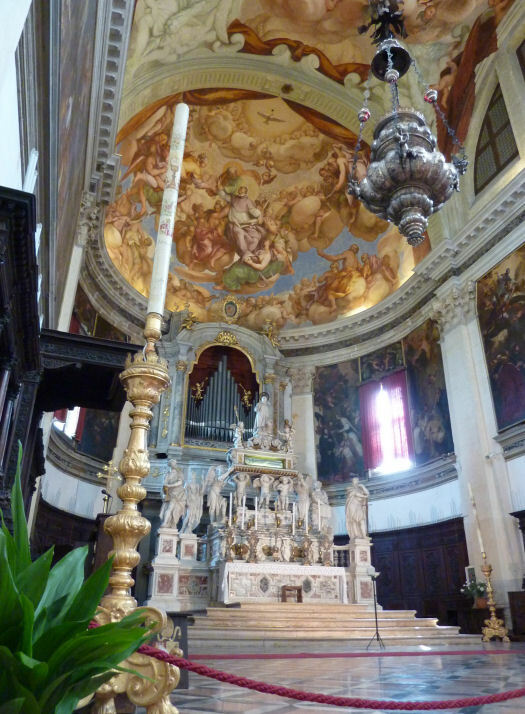 The interior was also completed by Grapiglia, with the Vendramin Chapel on the left by Longhena, who also designed the somewhat overpopulated high altar of 1649 which was executed by Clemente Moli. 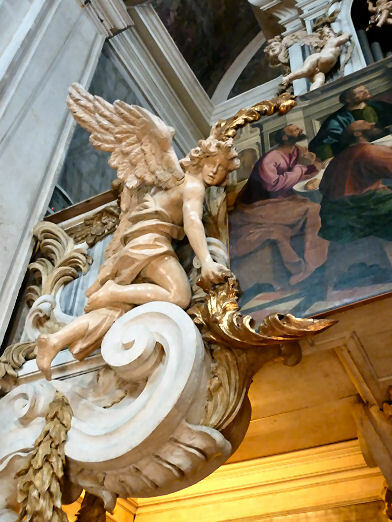 The remains of the first patriarch of Venice, San Lorenzo Giustiniani, are preserved in an urn supported by angels above Longhena's flamboyant high altar. In the right-hand aisle is Saint Peter's Throne, a carved marble throne upon which Saint Peter supposedly rested whilst in Antioch, containing a Muslim funerary stele and carved verses from the Koran. The Lando Chapel is a pleasant little space, the only survival from the earlier gothic church, with a mosaic altarpiece based on a Tintoretto cartoon. Luca Giordano, Pellegrini and Veronese are represented, amongst some middling 18th-century art. The 1653 Madonna of the Carmelites and Child with Souls in Purgatory by Luca Giordano was painted for Cardinal Francesco Vendramin. It was stolen from the church in October 1994, but found six weeks later, rolled up inside a packing tube in a garage in Mestre. Having suffered significant damage it was restored and returned to the Vendramin Chapel. The Saint Peter Enthroned with Saints Niccolò, Andrew, Jacob, and Anthony Abbot by Marco Basaiti, a pupil of Alvise Vivarini, greatly influenced by Giovanni Bellini and Cima, It is not one of his best works, but has a certain Bellini-like lustre - it opens out into a lovely landscape and is calmly in keeping with the mood of church. But it seems pasted into a too-large frame (over the third altar on the right) with some mock stone work painted in to fill the gap. The painting was originally in the Péoli d’Istria School Chapel in the Patriarchal palace, and was moved here in the 19th century. The two flanking marble statues are the prophets Isaiah and Geremia. The late altarpiece of Saints John the Evangelist, Peter and Paul by Paolo Veronese which is now on the wall over the door of the Lando chapel, in the left aisle, was commissioned by Giovanni Trevisan, the 13th Patriarch of Venice, for the altar here he had dedicated to Saint John the Evangelist, completed by 1581. The painting was restored in 2004. 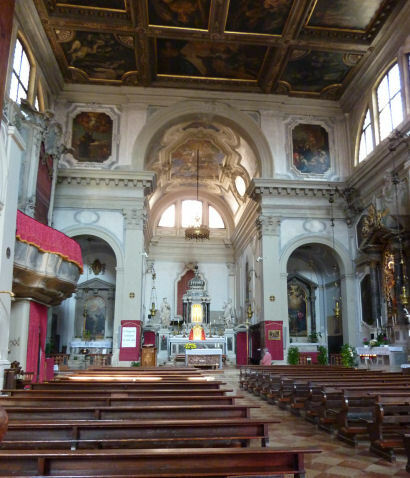 Giambattista Tiepolo was baptised here on 16th April 1696. 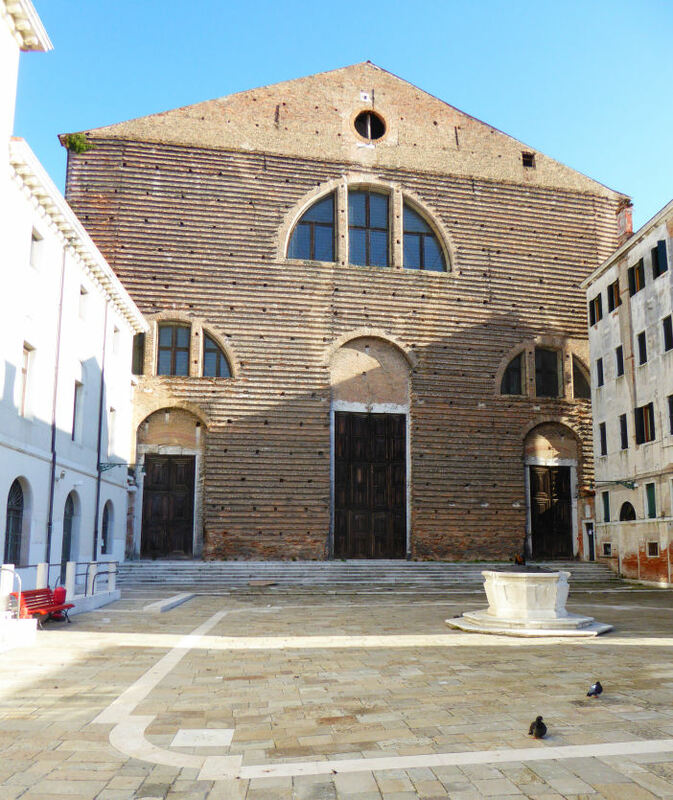 At this time the church was still the cathedral of Venice, but it was also the family's local church. A Paulo Veneziano-like fragment depicting Saint John the Baptist, now in the Correr Museum, probably originated here. To the right of the church is the former Patriarchal Palace, with a large gateway leading to a lovely 16th century cloister which was made into a barracks in 1807 and is now social housing and attractively ramshackle. On a visit in early 2007 I recorded a man just singing his heart out in this cloister to an accompaniment of birdsong. Click here to listen to an mp3 of this fragrant fragment. Or the video is to the right. It's a bit rough, and made with just a compact still camera, but it has a certain something. Detached, standing in the campo in front of the church, one of the few campi in Venice which is still grassed over. Erected in 774, it collapsed in 1120 in a fire, was rebuilt, but destroyed again in a storm in 1442. Rebuilt 1463-64, but damaged by lightening in 1482. Rebuilt 1482-90 by Mauro Codussi, and faced with Istrian stone, it's a chunky and memorable tower and the only stone-clad campanile in Venice. The original dome was blown off in 1659 and replaced with a polygonal drum in 1670. It was described by P. Barbaro in 1482 as 'powerful, isolated, crystal-white. Immobile at its base, yet in movement up there amongst the clouds. It is sculpture, caught between entrapment and flight...ready to flee with the wind.' Restored in 1884, 1902 and 2000, it still leans to the East. The Querini Stampalia gallery has L'Ingresso del Patriarca a San Pietro di Castello by Gabriel Bella (1779). See it here. The Gemäldegalerie in Berlin has Canaletto's The Vigilia di San Pietro. Leaning Tower of San Pietro, Venice, an oil painting by Félix Ziem done in the late 19th century, shows the campanile leaning at a somewhat astonishing angle. At a comparatively late period Venetian fathers went with their daughters to a great annual matrimonial fair at San Pietro di Castello Olivolo, and the youth of the lagoons repaired thither to choose wives from the number of the maidens. These were all dressed in white, with hair loose about the neck, and each bore her dower in a little box, slung over her shoulder by a ribbon. It is to be supposed that there was commonly a previous understanding between each damsel and some youth in the crowd: as soon as all had paired off, the bishop gave them a sermon and his benediction, and the young men gathered up their brides and boxes, and went away wedded. It was on one of these occasions, in the year 944, that the Triestine pirates stole the Brides of Venice with their dowers, and gave occasion to the Festa delle Marie, already described, and to Rogers's poem, which every body pretends to have read.